BodyHoliday is proud to offer retreat programmes in addition to our wellness holidays. Participants can select a week-long retreat, based on yoga, weight loss mindfulness and detox, whilst staying at BodyHoliday’s luxurious villa “Firefly”. 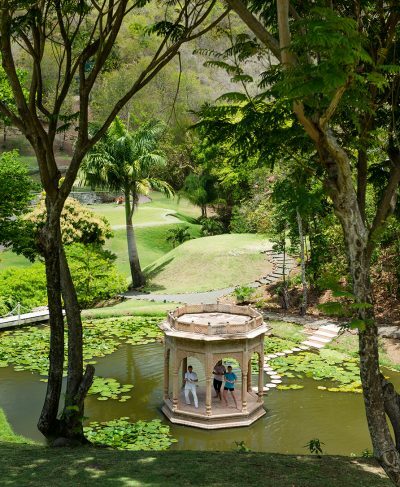 This beautiful Caribbean residence overlooks the resort and enables retreat guests to both enjoy the camaraderie and seclusion afforded by Firefly and join in resort activities in their free time. The warmth and beauty of Saint Lucia, combined with a first-class retreat programme awaits you at the World’s leading holiday of well-being. 6th April – 13th April 2019. The following Yoga retreat dates are also confirmed for this year. Villa Firefly is a grand Caribbean residence, situated in the grounds of the resort, overlooking the beach and with a panoramic view. What’s Included in our Retreats? Each of our retreats is fully inclusive of luxury accommodation at the Villa Firefly residence*, all food and beverage and of course the specifics relating to the retreat you have chosen. It is also inclusive of everything that’s normally included at the BodyHoliday. So if during some free time you decide, for example, to take an archery class or try your hand at fencing, that’s included. There is so much to do and experience at the BodyHoliday, a quick look at this What’s Included summary will give you the details. Guests at the BodyHoliday nearly always utilize our BodyHoliday specialist to pre-plan their stay, before arriving. This service is complimentary and since being on a retreat, much of your time will already be allocated to retreat activities, using this customization service is a useful tool in making the most of your free time. *Rooms for the retreats are also allocated in the Luxury Garden View Rooms with no supplement for single occupancy. Will I have time to experience any of the BodyHoliday activities? Yes certainly. Every retreat programme allows for periods of downtime, during which you can simply relax, book extra treatments or take part in sports and activities. Can I use the facilities at BodyHoliday? Of course. Your retreat pricing includes everything you would expect from a regular BodyHoliday, in addition to your special retreat program. Will I take all my meals at the Villa? Although you will dine together in your exclusive retreat villa for your evening meal, BodyHoliday has a variety of culinary experiences for you to enjoy for breakfast, lunch and all those times in between! How far is Villa Firefly from the main resort area? Firefly is connected to the resort by a driveway and path through the garden. It’s a few minutes walk. We think the distance is ideal as it is close enough to make the main resort easily accessible and then far enough away to allow tranquillity, during a retreat. The ‘state of the art’ BodyScience clinic at the resort, presents a fusion of Western scientific analytics and ancient Eastern preventive medicine as embodied in Ayurvedic practices.